Temporomandibular Disorder is a common and painful condition that can cause tenderness on each side of the head near the joints, along the jaw, or in front of the ears. This is the same joint that allows humans to talk, chew, and even yawn, so any pain in this area can be debilitating. Anyone that has recently felt this type of chronic pain shoulder understand what symptoms to look for, why they may be experiencing it, and what TMJ treatment an experienced dentist may be able to offer you. Those that may believe that they may have this condition and be in need of Temporomandibular Disorder treatment should remain aware of some of the symptoms that they may be experiencing. This includes tenderness around the jaw, pain near the ears, difficulty chewing, aching facial pain, a locking of the joint, headaches, an uncomfortable bite, or uneven chewing patterns. There are many causes for this condition that patients should also remain aware of. Some of the most common causes include an erosion of the disk that aligns the jaw, damaged cartilage, trauma to the area, grinding of the teeth, and arthritis. Many of those in need of TMJ treatment often report they suffer from one or more of these catalysts. In rare cases, this ailment may go away without any professional Temporomandibular Disorder treatment. 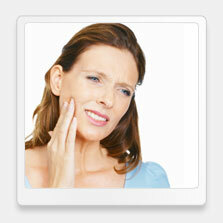 For those that continue to suffer from TMJ though, professional treatment by a dentist will most likely be necessary. For the most minor cases, over-the-counter painkillers may help to alleviate some of the pain while the jaw heals itself. Dentists may also prescribe powerful muscle relaxants that may help with headaches and clenching of the jaw. Some of the most severe cases may require Botulinum injections to realign the jaw. 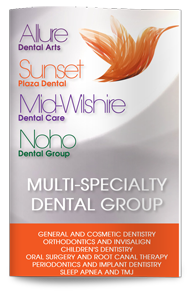 Our West Hollywood dentist is also proud to offer bite guards for nighttime use. This is one of the most effective and simple treatments for this disorder. These bite guards will not only help to relieve pressure while sleeping, it will also push the jaw forward into a correct alignment. If you or someone you know is currently suffering from TMJ disorder, contact our dental practice today to see what options may be right for you.